9ct or 18 ct gold signet ring - rose, white or yellow gold? 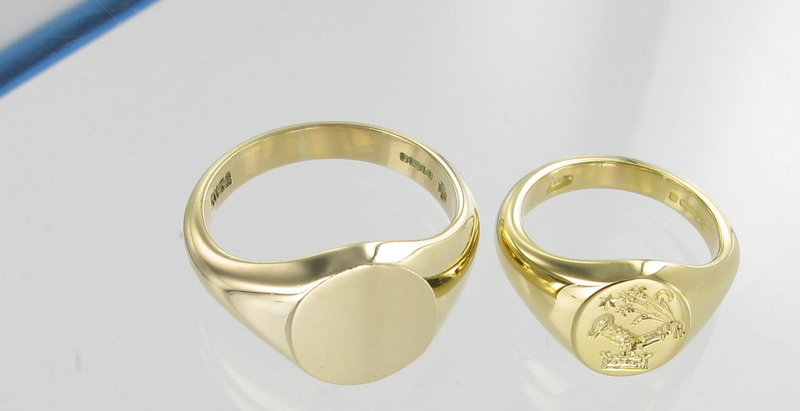 When choosing your signet ring one of the main questions is which gold should you choose for your signet ring. You need to consider the carat of the gold as well as the colour. Which Gold should you choose? You can get a range of carats, traditionally in the UK 9 or 18 carat. In the rest of Europe you can get 14 carat gold as well as the standard 18 carat. 22 carat gold is obtainable in some overseas countries (like India) but this is considered too soft to make any lasting jewellery that retains its original detail. What is the difference between the carats? Different carats have different hardness ratings and different densities. If you are wearing two or more rings together on the same finger you should really go for the same carat so that one doesn’t wear more quickly. The yellowness of gold: 9 carat yellow gold has less gold in it than 18 carat and you can see this in the colour difference; 18 carat is much more yellow than 9 carat. Should I choose 9 carat or 18 Carat? This is a point of personal preference and of course, your budget. 18 carat tends to be softer and will wear quicker as the metal is more pliable. People like this feature as it tends to mould to your finger quicker and the edges wear, giving it a natural antique finish quicker than a 9 carat ring. The engraving detail will last longer on a 9 carat ring – at least 25 years before you might even consider re-engraving. Engravings on 18 carat will last less long but it will still be good for 15 – 20 years and sometimes more. Of course this all depends on how often you wear your signet ring and how much you use your hands. The photo above shows the paler 9 carat gold on the left and the more yellow 19 carat gold on the right. White gold: Some people think yellow gold does not suit their skin colouring so go for white gold instead. White gold comes in all the same carats as yellow gold. White gold has yellow gold in it but has other metals such as silver and palladium in it to give it it’s ‘whiteness’. 9 carat rings have more silver and 18 carat rings have a higher proportion of palladium. White gold used to be made with nickel in it which gave a much whiter look, however this has now been outlawed as it is toxic. The new white gold rings do not retain their whiteness nearly as long as old traditional white gold rings. White gold will always become slightly yellow over time. When we supply white gold rings we polish them highly and they look like bright silver. However after one year there will be a noticeable difference after they have yellowed up a bit. We can rhodium plate the ring which makes them look spectacular in the short term but before too long the rhodium plating will wear and you’ll notice the yellow colour coming through at points of wear on the finger (and of course scratches will show). It is relatively inexpensive to get your white gold rings re-rhodium plated. Rose gold: Rose gold has a lovely deep pink or even reddish colour . Many people associate it with an antique gold as it was more popular in the past. Rose gold tends to come and go with fashion. However it seems to be getting quite popular again. The 18 carat rose gold is much pinker than the 9 carat rose gold. Platinum: Platinum is a very hard and dense precious metal, it is much heavier than gold and much more expensive. You are really making a sound investment in buying platinum as it will last and wear better than any other precious metal. Previous PostBlack Onyx Palladium Signet Ring Great Christmas GiftNext PostSeal engraving or sight engraving? Can we get the gold in Welsh gold? I hear it is a whiter type of gold. Hello Mrs S Ley!! Thank you for your messages. The Welsh Gold is a red gold rather than a white gold and yes we do make the signet rings in this gold. Would you like me to send you some horse crests?